Kadhai Paneer: Kadhai paneer is a mouth watering combination of paneer, capsicum, tomato, onion and traditional Indian spices cooked in ghee, is one of the most popular curry recipes of Indian and Punjabi cuisine. It is a main course curry recipe and generally served with Indian breads like roti, naan, kulcha, paratha, etc. Due to its exotic taste and looks, it generally finds its way into the menu of important functions like marriage. Heat a non-stick frying pan, on low heat. Dry roast coriander seeds, kashmiri red chilli and green cardamom until a nice aroma is released, takes about 1-minute over low flame. Grind the dry roasted ingredients in a grinder to a smooth dry spice powder. Keep the dry spice powder aside. Note: If you are using frozen paneer, then defrost it before cooking; by placing paneer cubes in hot water for 7-8 minutes to keep them soft. Drain them and keep aside until required. Heat the oil in a non-stick pan over medium flame. Add in the chopped onion. Sauté until the onions turns translucent. Add in the ginger-garlic paste and red chilli powder. Add in the chopped tomatoes. Cook until the tomatoes turn tender and oil starts to separate; takes about 4-5 minutes. Add in the dry spice powder. Add in the chopped capsicum. Season the curry with salt. Crush dried fenugreek leaves (kasuri methi) using your hand and add in the curry. Add in the 1/3 cup water. Add in the paneer cubes. Add in the fresh cream. Note: Do not cook for longer after adding fresh cream otherwise it may curdle. Kadhai paneer is ready to be served. Transfer prepared kadhai paneer to a serving bowl and serve hot with jeera rice or chapatti. 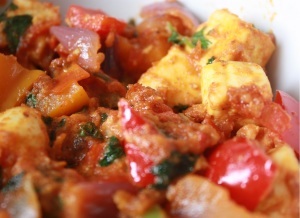 If you have any queries regarding the Kadhai Paneer recipe, please leave a comment.